As with Innistrad, Dark Ascension brings double-faced cards to Magic. 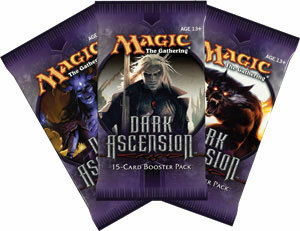 Dark Ascension continues the storyline of Innistrad on the plane of the same name. Thematically, the plane is still plagued by Werewolves, Zombies, Vampires, Ghosts and other creatures of the night. The set puts a stronger emphasis on these creature types, such as providing a lord for each of them. Meanwhile, the humans are on the verge of extinction and have to take desperate measures to stem the tide. All the major mechanics of the previous set, including Double-faced cards, return. The set introduces a new keyword mechanic in Undying. It functions very similar to Persist, but instead of -1/-1 counters, it adds a +1/+1 counter to the creature when it returns from the grave. Fateful hour is a new ability word, which scales up an effect if the controller of the effect is at 5 life or less. Double-faced cards return with this set, further showcasing the transformation mechanic. Flashback, Morbid and Curses also return. MtG collecting can be frustrating but attempting to keep up with game mechanics can be more so. Both of these frustrations I accept as part of the game’s character and my own completionist addiction. But when the new 2-sided cards came out l nearly boycotted the set (right after buying one booster box to score the planeswalker I wanted, I AM an addict after all). I really didnt like this gimmick, just as much as I don’t like it’s floppy eared equivalent. It felt too cute. Too commercialized, if that is even possible for a commercial product. I realize buying the booster box only helped exasperate the problem. Then I tried PLAYING it. I must admit the gameplay of Dark Ascension isn’t horrible. The planeswalkers are interesting and valuable, and, as much as it pains me, the 2-sided cards bring a clever dynamic that forces even veteran players to take a moment to rethink strategies. The best thing about MtG is that you don’t have to fork out fifty bucks or more to check it out. Single boosters are cheap and the event decks are worth every penny for the playability and cards included. Go ahead and give it a look. 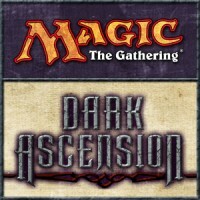 Add a Review for "Magic: The Gathering – Dark Ascension"